India is mainly known for its rich diversities. In the past ears, various rulers ruled across some parts of the country. Rajasthan is one of those areas. The various parts of India are mostly separated by its culture fabric designs. The fabric is a piece of cloth made from fibers of wool, cotton, and yarn. It also represents the cities culture in various structures. Jaipur is one of the most populated cities in Rajasthan. It is renowned for its great historical places. With the advancement, the country is usually losing some of their past histories. To keep these past views, alive artisans have started crafting them over fabrics. The fabric is usually a cloth containing various styles and designs planted on them. A huge number of craftsmen are found in Jaipur. They with proper utilization of their mind craft various historical views over their cloth pieces. Fabric resembles the past history in the form of small diagrams and drawings. The qualities of colors being used for these paintings are so attractive that they can easily pull people’s eye over their clothes. These can even make your room look magnificent. The Jaipur double bed sheets are well known today around the country. A person from all across comes to Jaipur to purchasing an item. But this is not possible for people staying out of the country. So Jaipur people have adapted a method of online marketing. Various items like bed sheet both single and double, cushions, quilts, etc. are put for sell. The online quality double bed sheets are suitable for purchase. Images of royal kingdoms are printed upon especially by hands or block techniques. This method requires a huge effort by humans. The people carrying out this job must be skilled and talented. But the technique of tie and then dye are quite common for all printing methods. Jaipuri arts can be designed over a wide range of fabrics. But the people of Jaipur have adapted the Bagru and block based Sanganeri technique. Both require huge efforts by the craftsmen. Especially the block print double bed sheet uses a black color to craft images. This gives them a stylish look and also allows them to retain the fragrance of past eras. Apart from these the handmade crafting also plays a vital role. 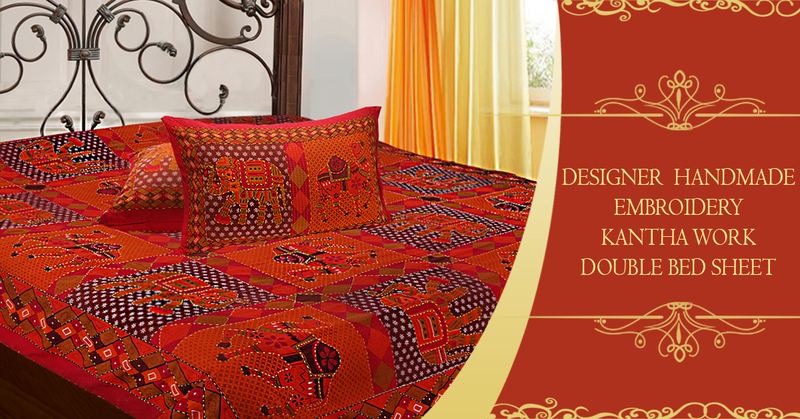 Thus, the Indian double bed sheets from Jaipur are well stylish and gorgeous for people who mostly love their culture. The people of Jaipur can only craft and design such a great, fascinating outlook fabric.